Water parks are the places to take the kids for some splashy, memorable thrills, and summertime fun. California has many water parks to choose from. These are some of the biggest and best the state has to offer. Water parks are open seasonally; check the websites for current information. This water park in Concord in the Bay Area boasts a new attraction for 2018: Splashwater Island, a four-story water play area with more than 100 fun features. And there's more: Waterworld also has eight water slides and waves, rivers, and pools for the less adventurous and littlest members of your group, so everyone can get seriously wet, no matter their age or adventure quotient. LEGOLAND California, about a half an hour's drive north of San Diego and an hour south of Anaheim, offers kids some unusual water park adventures. For Build-a-Raft River, the kids build a raft of LEGOs before floating down the river, and at Imagination Station, kids make bridges, dams, and cities out of DUPLO bricks and see how they stand up in the water. There are also more conventional slides and rides where everyone gets soaked. Raging Waters, with parks in Sacramento, San Jose (Bay Area) and San Dimas (Greater Los Angeles), has the largest water parks in California. USA Today named the park in San Dimas one of the top ten water parks in the United States. It's the state's largest water park and has 50 acres of rides, slides, and other attractions that will make the day of even the most demanding visitor. 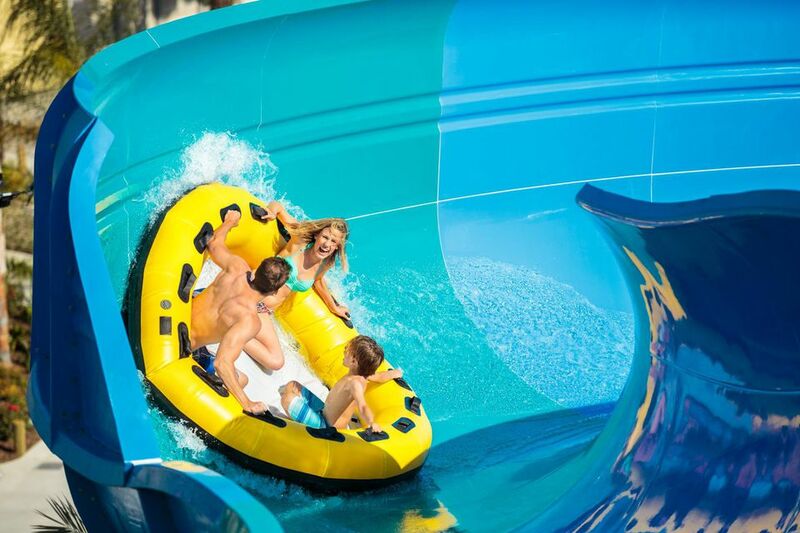 Check out Big Surf Shores, Loggerhead Lane, Kata's Kookaburra Cove, Slippity Dippity, and Walkabout Waters at this water park at SeaWorld San Diego. You can also check out the flamingos and freshwater turtles, go on rides, and get a bite to eat on an all-day adventure. Boomerang Bay, at California's Great America in Santa Clara in the Bay Area, has a whole slew of fun watery things to do. Try out Boomerang Lagoon, Great Barrier Reef, Jackaroo Landing, Castaway Creek, Kookaburra Cay, Down Under Thunder, Tasmanian Typhoon, and Screamin' Wombat, just to name a few choices. Water rides, slides, surf simulators, wave pools, and outdoor activity pools await at the water park at Great Wolf Lodge in Anaheim. Great Wolf characters join in the fun all day at the park, and when you want a break, rent a cabana for some down time before you dive in again. Knott's Soak City boasts that it is the biggest water park in Orange County, complete with a seven-story plunge, Gremmie Lagoon, and seven water slides new in 2017. Reserve a cabana if you want to duck out of the sun for a bit. Or stop in at one of the park's many restaurants, which include Boardwalk BBQ, Cable Car Kitchen, Calico Saloon, Cave Inn, and Farm Bakery, among many others. At Six Flags Hurricane Harbor in Valencia, you'll find a whitewater run, a lagoon to chill out in, bunches of slides, a climb-in-the-water zone, raft courses, and a river cruise. You'll be soaking wet when the day is done at Hurricane Harbor. After you’ve worked up an appetite slipping and sliding around, dig into some all American favorites or Italian fare, slurp on some ice cream, or keep off all those calories you burned with some healthy options.